A former training adviser who worked at Northcliffe Media for 35 years has died from carbon monoxide poisoning at the age of 59. Graham Beesley, left, started out with the regional publisher at the Scunthorpe Telegraph, where he was responsible for circulation, before he became a training manager. Based at Grimsby, he was responsible for management and leadership training at Northcliffe centres across the country, making him known to many of the company’s senior journalists. Graham died at his North Cotes home on 26 September and a post mortem revealed he died after inhaling a high level of carbon monoxide from a faulty wood burner. In his role at the regional publisher, Graham was mainly focussed on the Northcliffe Leadership Programme, which provided management training, and the provision of E-learning. 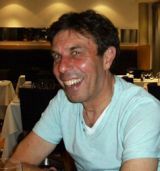 He took early retirement two years ago to become a ski instructor and mountaineer and was just weeks away from his 60th birthday when he died. Mark Price, Grimsby and Scunthorpe Media Group managing director, said: “I have worked within Northcliffe Media for a considerable number of years and the majority were shared with Graham. “He was always helpful and always keen to take an interest in every side of the business. Former Telegraph colleague Rob Sunley, a fellow mountaineer, said: “Graham spent the past ten years preparing for his new life as an instructor and mountain guide. “He was very well-known in skiing and climbing circles. He loved the Alps. I have such huge respect for him as he was a born leader. He was an amazing guy. “It is such a tragedy and so tragic he has gone so soon after our other climbing friend from the Telegraph, David Neal, also passed away. Graham leaves his mother Joan, cousin Steve and other relatives. My condolences to Graham’s family. He was a great guy, and I will always fondly remember our conversations deep into the evening at a hotel bar in Cheltenham, putting the world, or at least the world of newspapers, to rights. I spoke to him shortly after the left the industry and he seemed so happy to be heading off to the mountains. Oh dear – one of life’s nice guys! I knew Graham for many years as we both worked for NML. My thoughts are with his nearest and dearest. Sad news indeed. I too worked with Graham for many years at Northcliffe Newspapers in the eighties and early nineties. He was a very nice chap, good at his job. Graham was a wonderful person, a great trainer and a good support whenever people needed advice. He also had a great sense of humour that helped people at NML smile. I met Graham when I joined Northcliffe in back 1983. He was such a lovely person. Kind, helpful, good fun and a great trainer. I hadn’t seen him for years and then we met quite accidentally in Norfolk last year. We had a great time recalling the good old times at Scunthorpe and Grimsby Telegraphs and our ex Northcliffe colleagues. My heartfelt sympathy goes to his family and his many good friends. Hi Angie how are you doing?